While having a rest from work over the Christmas/New Year break I looked back over 2016 and thought it has really flown. There has been a lot philatelically that has gone on during the year, both nationally and internationally. As a result I really haven’t had much of a chance to just chill out and play with my stamps (other than working on exhibits and exhibitions to which I had committed). Anyway, I had got out some of the accumulations of albums and stamps acquired throughout the year and had just started to sort them out to go into my albums when I had a call from the editor reminding me about this article. So the piles of stamps on the tray will have to wait until tomorrow. 2016 has been a very busy year not only for me. I would like to thank all of you that have supported your clubs; helping with the organisation and running of events; supporting club circuit books and auctions; and, supporting exhibitions by entering and volunteering. Congratulations to those of you who, during 2016, entered and received awards at the various club and inter-club competitions or at national or overseas exhibitions. I keep getting good reports of regional and club shows throughout the country with good attendances and with an increasing number of exhibits and material on show compared with previous year. Congratulations to the Manawatu Philatelic society for their winning year. I believe the national exhibition in Christchurch in November was successful and enjoyed by everyone who attended. I note that there were a significant number of new exhibitors who entered which augers well for the future. Another New Zealand highlight in 2016 was the North Island team recently defending the Australasian Challenge and our New Zealand youth performing very successfully, once again. From an exhibiting point of view 2017 is going to be another exciting year. It really kicks off with the FIAP exhibition in Melbourne in a couple of months’ time; follows with a number of regional shows throughout the year and the two half national exhibitions in Hamilton and Adelaide. For a while it looked like there would be no national exhibitions in either New Zealand or Australia on 2017 so it is pleasing to have the Royal Philatelic Society of NZ’s Royalpex 2017 and South Australia’s Stampex 2017 which are joint half nationals – that is all of the international and national exhibiting classes will be covered by one or other. From an organisational point of view 2017 is also going to be a challenging year for Federation and its members. With this newsletter your club will also be receiving a questionnaire seeking their views for our strategic planning meeting planned for March. This questionnaire will also be available for individuals as well. We need as many as possible returned with responses. Not all of the questions need be answered but the more feedback we get the better we can gauge the thoughts of our members and individuals. If there are other things you think Federation should consider, feel free to add it to your response to the questionnaire, and I assure you that it will be discussed. If you would like to have additional support for your submission, why not contact one of your two regional delegates. We need to know what YOU think Federation should be doing into the future and where we need to be in say 20 years’ time. As previously signalled Federation is undertaking a strategic review during 2017. It has taken some initial steps in the process but first it wants to hear from you. What should or could Federation do, do better or, perhaps even do less? How should it go about doing what it should be doing? We need responses by 4 March 2017 so they can be collated and considered by the executive before they discuss them at their strategic planning meeting to be held on 19 March. The outcomes from that meeting will be reported and discussed with societies, clubs and individuals. Federation will then formulate their plans and prepare any necessary proposals that will require formal adoption at the annual general meeting in November. We are keen to see as many members as possible at the AGM and have decided to hold it on Saturday 25 November. It will be held during Royalpex 2017 at the same Hamilton venue. At a recent Thematic Association of NZ meeting held at the Christchurch Stamp & Postcard Show 2016 the discussion touched upon promotion of our hobby. How do we increase numbers interested in stamp collecting/thematic collecting? Matt Henderson of Waimate provided some useful input to the discussion and was asked to provide an article for ThemeNZ the Association’s newsletter. We believe this needed to go to a wider audience so here is what Matt wrote. Firstly, let me say there are no easy answers. We have to compete for people’s interest and time far more today than in the past – there are just so many more activities for one to engage in. We, the collectors and enthusiasts have to work extremely hard to promote the hobby. I don’t have any “golden bullet”. I’ve lived and worked in smaller communities for many years and have tried to make the hobby relevant to people there – to show them stamp collecting can add an extra dimension to their other activities and interests. Let me share some of my thoughts with you. We all have a responsibility to promote the hobby. If we don’t, no one else will. Share your passion. Bring a person who shows an interest in the hobby along to a stamp club meeting. Actually ask them to come and offer to pick them up so they can come. Put on a stamp display in the local Library. Ask. Make it topical. Do not leave it up for too long – a fortnight is long enough. Write an article for the local paper. Make people aware of what is available and that people are still interested in the hobby. Why not a monthly article? Highlight special issues in the newspaper. For example, when the RSA issue came out this year did you get a photograph of the RSA President and a local stamp collector published? Look for common links with other collector clubs – the museum, local historical society, genealogy club, etc. Why not talk at one of their meetings? Show how we can help each other. Talk to your local Post Shop owner. Let them know your interests, the club’s interests, etc. Get them to come and speak at one of your meetings. Working together you will achieve far more than pulling in different directions. Does your Post Office/town have a unique date stamp? It should have as it is great for town promotion. Use it whenever you are able. Let others know stamp collecting is alive and well in your community. Let people know where the town’s date stamp is available from. “Every Stamp tells a story”. Have you spoken to the social studies, history or geography teacher at the local secondary school (or their Association)? Do they know how you or even one stamp can assist them to interest their students? Why not show them an ex-student (Natalie Rooney – Silver Medallist at the Rio Games) is on a stamp? Put on a display for an event being held in the town – the local rose show, dog show, hobbies fair, etc. – all you need do is ask. Your enthusiasm will win them over. Stamps have links with so many other activities. Run a stamp session as part of a school holiday programme. Yes, you will be baby- sitting many of the young people but your passion for the hobby may help to encourage some. There are many other things that can be done to encourage people into the hobby. For me, the most important ingredient is your “passion” for the hobby. Share that with others and hopefully our numbers will grow. Part of the NY2016 ‘adult beginner’ area. Note the wide spread of ages represented here. 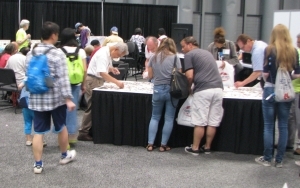 At the NY2016 Stamp Show there was, as is often the case at FIP international exhibitions, a large area set aside for youth. However, what impressed your editor was that an almost equally large area had been set aside for ‘Adult beginners’. Throughout the show this area was well patronised by people of all ages browsing through the material on hand, picking up ‘freebies’ (stamps, brochures on collecting, stamp club details, etc. ), using some of the equipment available to take a closer look at stamps, or talking with the many helpers who were on hand to assist them. We wonder how many adults who were potential collectors have been put off because our clubs have not been accessible or approaches that have been made were not handled as well as they could. We were all beginners at one time. Many of us were children when we did start and adults react differently to a young enquirer than they do to an adult. Often adults “know they should know” and are therefore often diffident showing off their lack of knowledge. It is important they are encouraged by our responses. Arrangements were made to move the exhibition frames, previously stored privately near Whangarei to Speldhurst Lockups near Levin. Leigh Gravestock, central region delegate and convenor for the frames project, advised “two small trucks (drivable with car licences) were hired and over the weekend of 9 to 12 September Bob Gibson and I drove up and collected the frames. While the move was not cheap it cost considerably less than a commercial operator would have been. 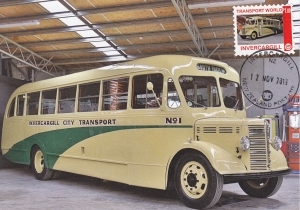 “The condition of the Whangarei frames was generally good although some do require repair work on pockets and the Perspex doors. “At the Christchurch Exhibition, I looked at a number of frames during set-up and thought they were often in average to poor condition reflecting how extensively they have been used. A number of frames will require extensive overhaul to be brought back to a suitable standard. “The upcoming task is to determine how we might best move forward. “Bob and Stephen Chivers undertook an investigation of the Australian frames during the recent Adelaide exhibition. All of the frames are stored in South Australia and the opportunity was taken to discuss aspects of their recent frame refurbishment. Unfortunately, the specially designed tooling used to mount the new pockets seemed unlikely to be suitable for our frames but in any case had been dismantled when the task was completed. In April 2016 the Health and Safety at Work Act 2015 (HSW Act) came into effect and this created concern for many regarding their responsibilities. 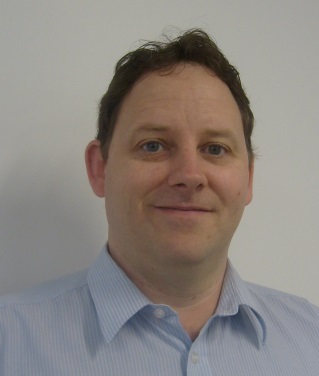 Tim Beach has written a brief guide for societies and provides links to several WorkSafe NZ factsheets. This guide can be found on the NZPF web site at health, safety and security considerations. Tim Beach, Chair of the Philatelic Youth Council of NZ has advised the next Youth Camp is to be held 16-22 July 2017 at Ardmore, near Auckland. We are sure it will be another successful event. There have been two red dot sales since July which have been successful in number of people and sales. The 2016 Keith Griffiths Memorial lecture was a well-received address by Gary Brown of Victoria based on his exhibit Cricket. North Shore held their Annual competition in October. The society considered it the best exhibition held by the Society for several years. They say “six Dealers were present, dealing with a steady stream of visitors. The kitchen did brisk trade and the raffles and the Treasure Hunt were well supported. “There were 32 frames of competitive entries on display which gave the judging team of David Loe, Len Jury, Jean Lee and Trevor Bevan plenty to think about. There were entries from Northland, Whangarei, Waikato, Taranaki, Levin, Raumati Beach and Christchurch as well as from Auckland. “The Youth Grand Award was won by 9 year old Samantha Rowe of the City of Sails club and the Adult Grand Award and a beautiful ceramic bowl went to Jenny Banfield of Raumati Beach. The Society celebrated its 40th Anniversary in September and held a well-attended lunch including a number of specially invited founding members. Members again attended the three day ModelX show in Henderson. They proved to be a popular stand for both youth and adults but unfortunately all the hard work did not result in additional members. This year the society not only held the annual Ambury Shield and PYC Inter-club Trophy it also hosted the New Zealand Inter-club One-frame Competition. The Postal History Society of NZ were the hosts this year and Miles Dillon represented them well with his talk on Missionaries, Miners and Mountains. The Ambury Shield attracted 48 exhibits from eight clubs. The winning club was again the Tauranga & Districts Stamp Club followed by Waikato and Whangarei. The Best in Show trophy went to Ross Marshall for his exhibit Russian Unpaid Mail to France via Prussia and the Best Novice trophy was won by Brian Ducker of the Tauranga & District Stamp Club for Tauranga’s Wartime Mails. “We elected to hold it in conjunction with the Ambury Shield in the hope that the large range of very good exhibits on display would encourage more people to come along, particularly those from out of town. Ten clubs from the Far North to Christchurch entered the Competition, a very pleasing number. The exhibits were judged by Ross Marshall, Lindsay Chitty, Robert Livingston and Graeme Russell in a 10 hour marathon effort. Our very grateful thanks to them all. “The winning club, with a very strong set of exhibits, was Manawatu Philatelic Society with the North Shore Philatelic Society coming second and the Christchurch Philatelic Society third. David Loe, of the North Shore Philatelic Society, received the Best Exhibit certificate for his Iceland – Í Gildi Overprints 1902-3. Your editor was present at the meeting where the president of Horowhenua announced the result of the Inter-club competition described above. He announced the club had come tenth – a particularly appropriate way of describing the outcome. With something like 25 other clubs who hadn’t even exhibited, Horowhenua, just as every other time they have entered, had done better than the majority of clubs. always seem to be involved in any activity going on in the Central Region. Congratulations Horowhenua – we applaud your efforts! As indicated Horowhenua are movers and shakers. The above indicate how they have done this metaphorically but unfortunately for them they have now had to do it literally. The November earthquake struck Levin as well and a subsequent inspection of the Red Cross Rooms the society uses for their meetings has been deemed it unsafe in its current shape. With little notice they have been obliged to pick up their gear and relocate. In November they were triumphant in the NZ Inter-club One-frame Competition. Congratulations Manawatu! As Waikato points out above, the prize for winning the NZ Inter-club is the responsibility for running the next one. Early in 2016 they ‘beefed up’ the annual Convention with a new banner name ‘Central District Stamp, Coin and Postcard Show’ and they plan to hold the 2017 show on Saturday 4 March. Details can be found in the ‘What’s on’ area of the NZPF website. Progress on shifting the school room to be used for their clubs rooms in Blenheim (see newsletter 71) progressed slowly to meet a number of operational and planning needs. However, the day to move arrived and the school room was lifted and placed on a truck ready to move on 20 November. And then, that night, the 7.8 magnitude earthquake struck and stopped the new clubroom being moved. “The road itself is down to single lane in places and one of the bridges down to a single lane also. So, unfortunately, it’s a waiting game. Josh advised he will keep us posted on progress. It may mean, of course, that the clubroom has found its new home by the time you read this. Dunedin Philatelic Society has adopted an operating name of Dunedin Stamp and Postcard Club. They recently moved to a suburban hall for their meetings and have found the public attendance at their fair has improved from that of the previous CBD venue. The Southland Stamp Club annual fair was well supported and included two specially produced CALs depicting vehicles from the recently opened Transport World Museum. 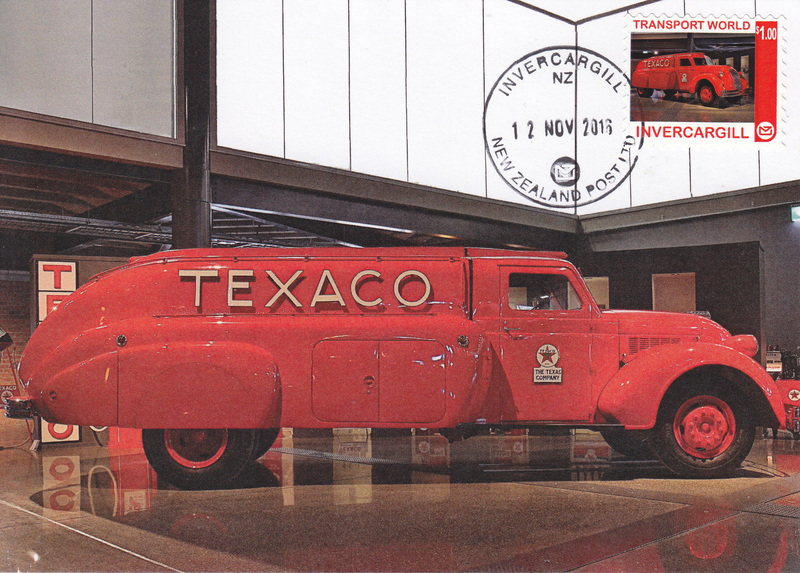 This received front page community press publicity as that Museum and its associated Motor Cycle Mecca are currently prominent in Invercargill news. The CALs and postcards were produced by Shades Stamp Shop, Christchurch. 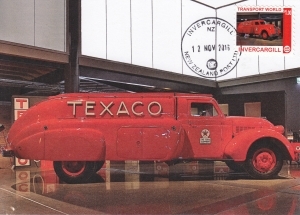 1940 Dodge RX70 Airflow ‘Texaco’ petrol tanker – one of only a few such vehicles left in the world. In the last newsletter we advised of a flurry of exhibitions for the last few months of 2016 with a number of overseas exhibitions and the Christchurch Stamps & Postcard Show in November. Stampex 2017 and Royalpex 2017 each provide a limited range of classes but between them all classes are covered. The NZ Commissioner for PhilaTaipei 2016 has, as a result of her experiences there, asked for all exhibitors to be reminded that protectors need to be trimmed close to the page. Not only is it difficult to mount oversize items leading to a final outcome that is an uneven or untidy presentation but worse, damage could be caused to exhibit pages and contents. She also pointed out that some exhibitors are placing additional blank pages behind the exhibit page to provide rigidity to the exhibit page. This obviously increases the overall weight of the exhibit and all too often Commissioners are facing major problems in staying within their airline weight limits. Use of a slightly heavier paper weight to mount the exhibits is a far more effective way to provide rigidity without incurring major overall weight increases. Some concern was raised about a lack of uniformity in requirements for numbering exhibition pages. It is becoming increasingly common to number, in pencil, the front of the pages at the bottom on the left or right in addition to any requirement to number on the reverse. It is important, if you do number the front, that the same position is used for all pages. Numbering the front, in the same place, enables the person installing the exhibit, the judges or any viewer to see that the pages have been installed in the correct order and, dare we say, the right way up! The NZPF model prospectus currently suggests numbering on the back but this is to be reviewed in the light of comments received and the benefits arising from numbering on the front. 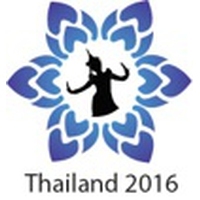 This exhibition was held in Bangkok 10-15 August 2016. As with all previous visits to Thailand, the atmosphere at the exhibition was very friendly. We arrived 6 hours late – two aborted take-offs at Wellington so we missed the QANTAS connection in Sydney and had a 6 hour wait for the next Thai Airlines flight. In spite of this we were warmly welcomed at the airport and the exhibits were put into Customs Bond. We were then quickly on our way to the hotel arriving at midnight – 26 hours after leaving home. The hotel was central but around one hour (or more depending on traffic) from the venue – buses were provided. The exhibition hall was in Ngamwongwan Shopping Mall, Nonthaburi on the 4th floor. The exhibition was opened by the Princess (Patron of the Philatelists Association of Thailand) which meant a 6am bus from the hotel and a “packed breakfast”! The exhibition had around 1,000 frames – 215 exhibits plus 23 Literature. New Zealand can be proud of the exhibits entered and the results. Norman Banfield was Jury Secretary and also judged the Literature Class. Stephen Chivers was on the Jury for his second apprenticeship. The exhibition was held in the Drill hall at the Torrens Parade Ground which was not far from the Adelaide CBD. As the exhibition was holding only the Australasian and postcard challenges the venue was an ideal size for the 249 frame Australasian challenge, 61 frames for the postcard challenge, 11 frames for the jury invited displays and 18 dealer’s stands. Eight Large Gold and 21 Gold medals were awarded which shows the level of material on show. I thought the North Island team was up against it this time around and was surprised when the marks were added up that we had won the challenge again with 512 points – beating NSW by one point. Thanks are due the exhibitors supporting the exhibition which meant I had to carry the Ed Druce Memorial trophy back home. Our postcard exhibitors also performed well coming a creditable second only four points behind the winner, South Australia, which achieved 335 points. 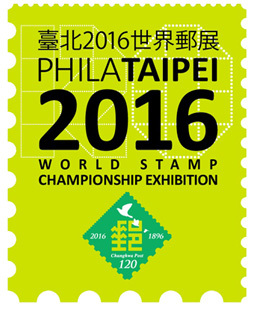 This World Stamp Championship Exhibition was held in Taipei 21-26 October at the World Trade Convention & Exhibition Centre. Frequent transport was provided between the official hotel and the exhibition. There was a Commissioner’s meeting every morning. There were 2,428 frames plus 131 Literature entries. I would like to thank all of the NZ exhibitors and NZPF for appointing me as Commissioner and for support with the airfare. A big ‘Thank You’ to NZ Post for providing giveaways to me as Commissioner and Jeff Long as a Jury member for passing to our colleagues at the exhibition. The Fair was held at the Mandurah & Peel Convention Centre, Mandurah approximately one hour south of Perth Airport, during 3 – 5 November 2016. I am very grateful to Jenny Banfield for accompanying me to this exhibition which was held 8-12 November 2016. Jenny was a ‘mine of information’ both before and during the exhibition, due to her previous experience in relationships with the Emirates Philatelic Association. We travelled via Melbourne to Dubai on the way over and via Sydney on our return. We spent two days in Dubai on our arrival as guests of Abdulla Khoory, President of Emirates Philatelic Association at one of his hotels, just opened a month ago. We then transferred (55kms) to the Sharjah exhibition hotel. Everyone was friendly and very hospitable, we were extremely well looked after. The exhibition, open for 5 days, was held in the Sharjah Mega Mall – total of 170 frames, predominately Traditional and Postal History. A postcard class was available for the first time in UAE. This exhibition was quite different from any I have attended nationally or overseas in that the exhibit frames were erected on Level 2 of a shopping mall. The mounting and dismounting of exhibits could only be done after 10pm at night when the mall closed for business. The ‘Jury Room’ was a coffee shop in the Mall, and tended to be a Jury bilingual team meeting. There were 26 trade stands on the ground floor predominately Middle East material, banknotes and coins. Jenny spent much of her time assisting various exhibitors/prospective exhibitors with exhibiting suggestions/advice. She is very highly respected in UAE philatelic circles. I had an overwhelming response in applications to exhibit in Sharjah —in all 53 frames. Due to the limitations of the venue only 25 frames from 6 exhibitors were accepted. We were able to hand carry the exhibits. There were no written critiques and medals awarded were FIP level, so one below those for a NZ national exhibition. There was an official opening ceremony by Emirates Post personnel and I did an interview for Dubai TV – unsure if it was ever broadcast. I would like to thank the NZ Philatelic Federation for appointing me Commissioner/Judge to Sharjah and their support with airfare costs. It was quite a different but enjoyable judging and social experience. The philatelic relationship with the UAE needs to be maintained. This national exhibition was held 18-20 November 2016 and featured a full range of philatelic exhibits plus postcards and other collectibles – nearly 5,000 pages of material in total. The exhibition organising committee Chairman, Karen Jeffrey reported that “the exhibition is now over and appears to have been a great success. “There were good numbers of people coming through the door, the dealers and NZ Post were happy with the way everything went. “Unfortunately the earthquakes that occurred on the Monday/Tuesday before the exhibition caused a few problems but fortunately this was nothing that couldn’t be overcome. “A successful exhibition dinner was held on the Saturday evening with 85 people attending. Many awards and special prizes were presented and a great night was had by all who attended. The Grand Award was won by Lionel Savins for The 1935 Pictorial Definitive Stamps of New Zealand and the Runner-up was John Pugsley for his The Boer War 1899-1902 Prisoners of War Mail. In 2016, once again, New Zealand youth exhibitors have done well at home but also at many overseas exhibitions. New Zealand Judges and commissioners advise they have often received praise for the overall standard of the New Zealand youth entries and no little envy from their overseas colleagues. In past issues of the newsletter we have reported the annual Youth Stamp Camps and the work PYC does encouraging youth collecting and exhibiting. The youth also receive help and assistance from their parents and from other ‘senior’ philatelists. There is, I am sure, a degree of friendly rivalry between, but also assistance from, the other youth exhibitors. However, at the end of the day, the exhibit remains their own work and is a huge credit to them all. While it is, perhaps, unfair to highlight any particular exhibitors there are two which deserve special mention for their efforts in 2016. The first is Warrick Wright. Warrick has been a regular exhibiting star over previous years and many people are well aware of his two exhibits Revenue Gathering Stamps of New Zealand and The Revenues of New Zealand Air Travel. Warrick has not only obtained good awards he has received Felicitations for both. Felicitations are only rarely given to adult exhibitors and are rarer still for youth. However, they may only be received once for any exhibit so in 2016 Warrick was not able to add further felicitations but added to his previous performances. His Revenue Gathering exhibit received the Youth Grand Award at Christchurch 2016, not the first time he has received such an award at a New Zealand National and we suspect it will not be the last. However, earlier in the year this exhibit, entered in the prestigious New York 2016 FIP International Exhibition, was crowned best youth exhibit in the show – a first for a New Zealand youth exhibitor at a full international FIP exhibition. Congratulations Warrick on another stellar year! The second is Amy Rosenfeldt. Amy’s traditional exhibit New Zealand Definitives 1975-80 received 89 marks and Best Youth in Show at Canberra early this year. Amy was in Age Class A and we hope to see further development in her exhibiting as she moves through the age classes in the years ahead. Tim Beach has been active in philately since the early 1980s entering his first stamp exhibition in 1985 as a teenager. Tim has been involved in the organised side of the hobby since 1991 when he became an executive member of the Philatelic Youth Council focusing on youth collecting. He has continued to be involved with PYC and has been its Chairperson since 2012. Tim sees youth collectors as the future of our hobby and believes we need to foster stamp collecting in our youth to provide a basis for future generations of our hobby. He attended his first Philatelic Youth Stamp Camp in 1987 as a youth and has been a Teaching Leader at various annual camps for the last 15 years. Tim is also a member of a number of other societies including the North Shore, Auckland, Waikato and the Royal Philatelic Society of London. Over the years Tim has held a number of positions in different philatelic organisations including secretary and treasurer and continues as one of the main leaders of the City of Sails Youth Stamp Club. Tim also collects a broad range of other philatelic and related material but his main stamp collecting interests have for a long time been focused around the New Zealand 1960 Pictorial issue and the stamp designer James Berry. The latter collection extends beyond just stamps with Berry also having designed coins and medals, illustrated books, painted landscape paintings and many other art pieces. Tim has conducted significant research and accumulated an extensive archive of Berry’s works and story. Tim is an active philatelic judge, having completed his first judging apprenticeship in 1996 and becoming fully qualified in 1998. As well as judging within New Zealand Tim has also represented NZ philately at a number of overseas exhibitions including Canada, Taiwan and Australia. He has been a frequent speaker over the years at philatelic gatherings throughout New Zealand talking about his philatelic exhibits, his collection of Post Office Money Boxes or James Berry memorabilia and ephemera.